April | 2013 | Desert Diamond Industries – Your Safety… Our Priority! We did a ton of business, had a ton of fun and took a ton of photos at the FDIC 2013 firefighter conference in Indianapolis, IN last week. Here’s some of the best after the break. This entry was posted in General Information and tagged Conventions, FDIC, General Information on April 30, 2013 by Desert Diamond Industries. Winners of Desert Diamond Industries’ FDIC 2013 Raffles! Desert Diamond Industries is proud to announce the winners of its raffles at FDIC 2013! Congratulations, Clinton, Christie and Kevin! And if you didn’t win any of our FDIC 2013 raffles, you can still be a winner! Just use the code on your raffle ticket to receive discounts of up to 50% on Fire Rescue Safety Blades, Ductile Iron Ring Saw Safety Blades, Carbide Roof Ventilation Blades, Carbide Chunk Blades, Safety Blade Grinder/Cutters, Monster Concrete Combo Blades, Champion Concrete Asphalt Combo Blades and Concrete Ring Saw Blades on our website! Hurry! This discount expires on May 31! This entry was posted in General Information and tagged Conventions, FDIC, General Information on April 29, 2013 by Desert Diamond Industries. Kevin Legacy, with our partners Brotherhood Instructors, LLC, has an article on getting and keeping power saws ready for calls over at Fire Engineering Magazine. 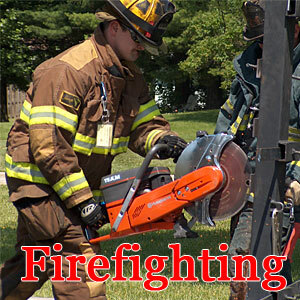 His article includes how to set up and store saws on apparatus after the daily check-off and common blade and fuel problems. It’s worth a look. Remember, we’ll be at the FDIC 2013 firefighter conference in Indianapolis, IN today and tomorrow! Visit us in Booth 9550 at the Lucas Oil Stadium. See our press release or this ad on the FDIC 2013 website for details. This entry was posted in Uncategorized on April 26, 2013 by Desert Diamond Industries. Does your department have chain saws and rotary saws? Ever wonder which one you should use? Chief John Mittendorf can answer that. Mittendorf’s essay Rotary Saws and Chain Saws, portions of which appeared in his book Truck Company Operations, has been reprinted over at the County of Los Angeles Firefighters’ Association website. The essay is worth any firefighter’s time. It details the strengths and weaknesses of both rotary saws and chain saws, as well as saw safety and what to look for in a fire rescue chain saw. This is what we got out of it. Chain saws should be used for roof ventilation. Rotary saws should be used for everything else. Remember, we’ll be at the FDIC 2013 firefighter conference in Indianapolis, IN today to Saturday! Visit us in Booth 9550 at the Lucas Oil Stadium. See our press release for details. This entry was posted in General Information and tagged Firefighting, General Information, Saws on April 25, 2013 by Desert Diamond Industries. Are Diamond Blades or Carbide Chunk Blades Better for Fire Rescue Cutting? When you grab your saw at a fire or a rescue, what kind of blade should be on your saw – diamond or carbide chunk? We’re partial to diamond blades (although we do sell carbide chunk blades, too), but you came here for answers, not our opinion. Luckily, Streetsmart Firefighter has them for you. Streetsmart Firefighter tested a diamond blade against a carbide chunk blade (here called a “nugget blade”) on roofing materials and various metals, including chains. They even recorded their tests, so you can see the results for yourself. Their conclusions? The diamond blade is great for almost all metal and masonry but not wood. The nugget blade is great for wood and thin metal (up to 3/16″) but not masonry. We’d like to point out that Streetsmart Firefighter was using a competitor’s diamond blade and not the Fire Rescue Safety Blade during their tests (see this article on our blog for how our blade fares against the competition). However, we agree with Streetsmart Firefighter’s conclusions if you’re using a competing diamond blade. Keep your carbide chunk blades. Just make sure you use them for the right jobs. Like we said, though, we are partial to diamond blades, so we’ll leave you with this Streetsmart Firefighter video from an article on cutting stucco. Remember, we’ll be at the FDIC 2013 firefighter conference in Indianapolis, IN from Thursday to Saturday! Visit us in Booth 9550 at the Lucas Oil Stadium. See our press release for details. This entry was posted in General Information, Video and tagged Carbide Chunk Blades, Diamond Blades, Firefighting, Forcible Entry, General Information, Video on April 24, 2013 by Desert Diamond Industries.